Asiatische Archipel und Neu Holland. 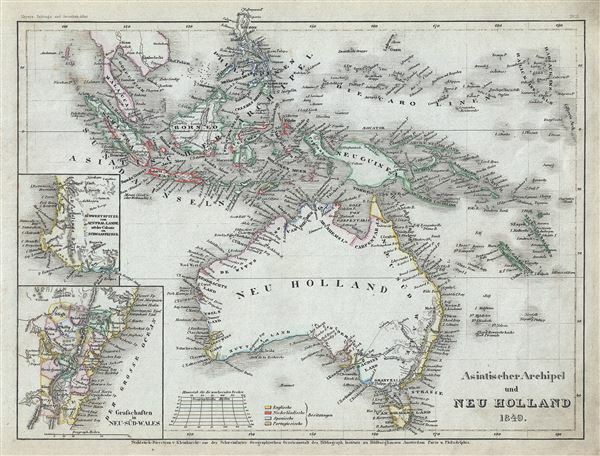 This is a fine example of Joseph Meyer's 1849 map of Australia and the East India Islands. It covers from the Malay Peninsula to New Caledonia, including Australia, Malaysia, Indonesia, Philippines, Papua New Guinea and Melanesia. An interesting map issued just as most of the earth's non-polar shore has been explored. This example depicts Australia with good detail along the coast and a largely unexplored interior. Outline color identifies British, Dutch, Spanish and Portuguese possessions. The lower left quadrant of the map features two insets detailing the southwestern part of Australia and New South Wales. This map was issued as plate no. 15 in Meyer's Zeitung Atlas. Although all the maps in this atlas are not individually dated, the title page and maps were often updated while the imprint with the date was not, causing confusion to the exact date for some of the maps. Moreover some maps in the atlas were taped in at a later date as an update to the atlas. We have dated the maps in this collection to the best of our ability.